MONTCOAL, W.Va. – A huge underground explosion blamed on methane gas killed 25 coal miners in the worst U.S. mining disaster in more than two decades. 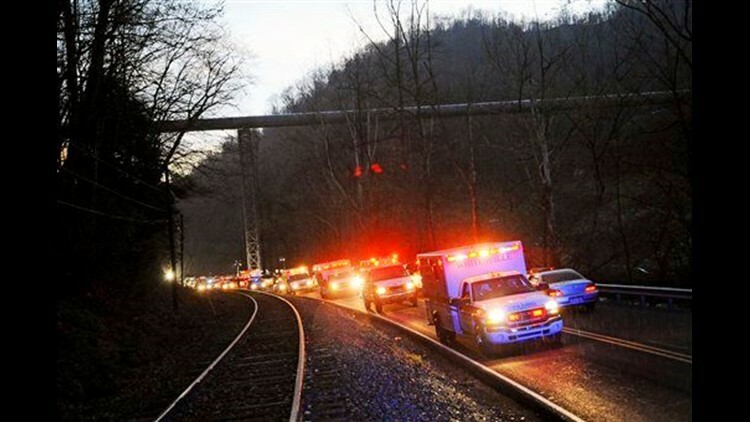 Four others were missing Tuesday, their chances of survival dimming as rescuers were held back by poison gases that accumulated near the blast site, about 1.5 miles from the entrance to Massey Energy Co.'s sprawling Upper Big Branch mine. The mine, about 30 miles south of Charleston, has a history of violations for not properly ventilating the highly combustible methane, safety officials said. Rescuers had to bulldoze an access road above it so they could begin drilling three shafts over 1,000 feet each to release methane and carbon monoxide that chased them from the mine after the blast Monday afternoon, Gov. Joe Manchin said at an early morning news briefing Tuesday. Drilling and ensuring rescuers can safely go in could take up to 12 hours, meaning the search was unlikely to resume before 6 p.m. Tuesday. "It's going to be a long day and we're not going to have a lot of information until we can get the first hole through," Manchin said. It had already been a long day for grieving relatives, some angry because they found out their loved ones were among the dead from government officials or a company Web site, not from Massey Energy executives. "They're supposed to be a big company," said Michelle McKinney, whose father, 62-year-old Benny R. Willingham, died in the blast. She found out from a local official at a school near the mine. "These guys, they took a chance every day to work and make them big. And they couldn't even call us." McKinney said her husband is a miner too and her 16-year-old son doesn't want him to go back to work. Willingham, who had mined for 30 years, the last 17 with Massey, was just five weeks from retiring and planned to take his wife on a cruise to the Virgin Islands next month. "Benny was the type — he probably wouldn't have stayed retired long," said his sister-in-law, Sheila Prillaman said. "He wasn't much of a homebody." Meanwhile, others waited for word about missing loved ones. Kevin Stricklin, an administrator for the federal Mine Safety and Health Administration, said the situation looked grim. "All we have left is hope, and we're going to continue to do what we can," he said. Officials hoped the four miners still unaccounted for were able to reach airtight chambers stocked with food, water and enough oxygen for them to live for four days, but rescue teams checked one of two such chambers nearby and it was empty. The buildup of gases prevented teams from reaching other chambers, officials said. A total of 31 miners were in the area during a shift change when the explosion rocked the mine. "Before you knew it, it was just like your ears stopped up, you couldn't hear and the next thing you know, it's just like you're just right in the middle of a tornado," miner Steve Smith, who heard the explosion but was able to escape, told ABC's "Good Morning America." Some of those killed may have died in the blast and others when they breathed in the gas-filled air, Stricklin said. Eleven bodies had been recovered and identified, but the other 14 have not. Names weren't released publicly, but Manchin said three of the dead are members of the same family. He said investigators still don't know what ignited the blast, but methane likely played a part. The death toll is the highest in a U.S. mine since 1984, when 27 died in a fire at Emery Mining Corp.'s mine in Orangeville, Utah. If the four missing bring the total to 29, it would be the most killed in a U.S. mine since a 1970 explosion killed 38 at Finley Coal Co., in Hyden, Ky.
"There's always danger. There's so many ways you can get hurt, or your life taken," said Gary Williams, a miner and pastor of New Life Assembly, a church near the southern West Virginia mine. "It's not something you dread every day, but there's always that danger. But for this area, it's the only way you're going to make a living." Though the situation looked bleak, Manchin said miracles can happen and pointed to the 2006 Sago Mine explosion that killed 12. Crews found miner Randal McCloy Jr. alive after he was trapped for more than 40 hours in an atmosphere poisoned with carbon monoxide. In Monday's blast, nine miners were leaving on a vehicle that takes them in and out of the mine's long shaft when a crew ahead of them felt a blast of air and went back to investigate, Stricklin said. They found seven workers dead. Others were hurt or missing about a mile and a half inside the mine, though there was some confusion over how many. Others made it out. In a statement early Tuesday, Massey Chairman and CEO Don Blankenship offered his condolences to the families of the dead. Massey Energy, a publicly traded company based in Richmond, Va., has 2.2 billion tons of coal reserves in southern West Virginia, eastern Kentucky, southwest Virginia and Tennessee. It ranks among the nation's top five coal producers and is among the industry's most profitable. It has a spotty safety record. In the past year, federal inspectors fined the company more than $382,000 for repeated serious violations involving its ventilation plan and equipment at Upper Big Branch. Methane is one of the great dangers of coal mining, and federal records say the Eagle coal seam releases up to 2 million cubic feet of methane gas into the Upper Big Branch mine every 24 hours, which is a large amount, said Dennis O'Dell, health and safety director for the United Mine Workers labor union. In mines, giant fans are used to keep the colorless, odorless gas concentrations below certain levels. If concentrations are allowed to build up, the gas can explode with a spark roughly similar to the static charge created by walking across a carpet in winter, as at the Sago mine, also in West Virginia. Since then, federal and state regulators have required mine operators to store extra oxygen supplies. Upper Big Branch uses containers that can generate about an hour of breathable air, and all miners carry a container on their belts besides the stockpiles inside the mine. Upper Big Branch has had three other fatalities in the last dozen years. Upper Big Branch has 19 openings and roughly 7-foot ceilings. Inside, it's crisscrossed with railroad tracks used for hauling people and equipment. It is located in a mine-laced swath of Raleigh and Boone counties that is the heart of West Virginia's coal country. The seam produced 1.2 million tons of coal in 2009, according to the mine safety agency, and has about 200 employees. "The federal Mine Safety and Health Administration will investigate this tragedy, and take action," U.S. Secretary of Labor Hilda L. Solis said in a statement. "Miners should never have to sacrifice their lives for their livelihood." Associated Press writers Allen G. Breed, Vicki Smith, Tom Breen and Tim Huber in West Virginia and Sam Hananel in Washington contributed to this report.